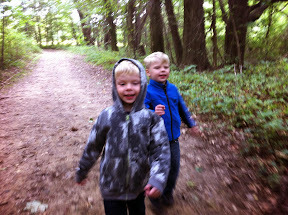 On Saturday we started the fall hiking spree that the metroparks does. After 8 hikes, we'll all get a walking stick. We started with silver creek in Medina. Yesterday, we visited my parents. The boys really wanted to see Grandma and Grandpa. The moment they got into their heads they could see them, they got dressed and put their shoes on before I even messaged them to see if they are home. Grandma messaged back saying she needs an hour and the are still in their pajamas. Jacob was confused and asked why. Joy said to him, maybe their pajamas are silly and they don't want you to see them in them. Later on Jacob insisted grandma to show him their silly pajamas. Grandma also read to them the Jasper man and Jacob dude book. He set up pillows for them on the floor. Joy stayed home and did her orders and also made a Halloween cake Jacob wanted. When we got home the boys insisted on candles and to sing "happy Halloween to you."